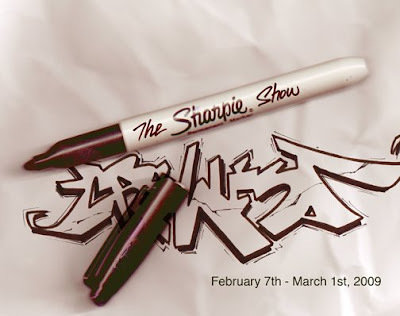 Sharpie loves our idea of having an exhibit focused on art created with the use of their markers and pens, so they're officially sponsoring it and lending their support! It's building up to be quite a show! We got cats from all over the US and the world participating. Graff artists, illustrators, cartoonists, tattoo artists and designers alike. Don't miss out! 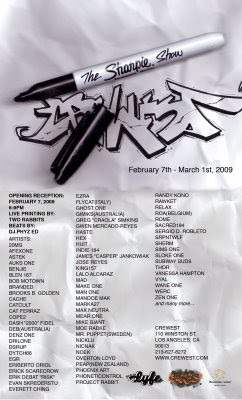 There will be a live screen printing session by Two Rabbits who will be knocking out a limited edition Sharpie inspired print designed by Man One. Live beats and grooves by Dj Phyz Ed. Free energy drinks by Roaring Lion and more! Check out the artist lineup! Thanks to our sponsors for being down! sharpie is down with your show cats! best of luck and don't forget to send snaps of the action to sharpie susan for posting on the sharpie blog.